About the only time that we have white rice in our house is when we order Chinese food, or have a sick child that needs it. Long ago, we made the switch to brown rice, whole grains and the like. The boys really do not know any better. Of course, they do seem to gobble up the white, sticky rice a bit more than when we have the more grainy and textured brown rice cousin. 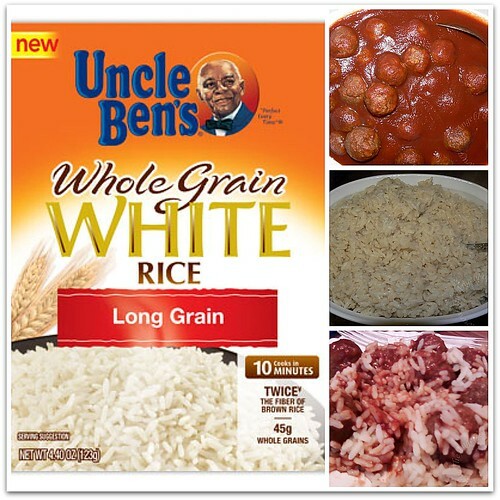 Recently, we were asked to try the new Uncle Ben’s Whole Grain White Rice. With the look, taste and texture of white rice, but packed with whole grains (almost a full day’s worth in one serving), Uncle Ben’s new Whole Grain White Rice provides a healthy alternative to plain sides like pasta or potatoes. The rice comes in a variety of flavors from traditional Long Grain to Chicken, Broccoli Cheddar, Taco Style and Sweet Tomato, so you can mix-up meals and still know that you’re getting whole grains on the table. Plus, with a quick 10-minute prep time, Uncle Ben’s Whole Grain White Rice provides a great solution for the nights when jam-packed schedules leave you scrambling for a quick, healthy option. We received our samples of the Uncle Ben’s Whole Grain White Rice just in time for JSL’s third birthday party. One of the dishes that we were making was sweet and sour meatballs (using vegetarian burger substitute). We figured that having rice to put the meatballs and sauce on would be a nice side. Plus, we could see what others thought. The instructions were easy to follow, it did not take too long to make, and was not overly sticky once prepared. Once in the serving dish, I immediately noticed how long the rice grains really were. It did look slightly different than the sticky white rice we get from time to time. There was not as much visible texture in comparison to the brown rice we get. This could definitely be a good thing when considering kids that are picky eaters. Speaking of picky eaters, even thought JSL was not going to eat the meatballs at his party, he asked to try the rice. As I predicted, he gobbled it up quickly and asked for more. When we ate leftovers the next evening, again he asked for the rice. When I made my plate, I put a little of the rice down with some of the Sweet and Sour "Meatballs" on top. I really enjoyed the long grains of the rice. It helped to soak up the delicious sauce. The rice was not gritty, like many high fiber/whole grain products can be. My only complaint – I wish Uncle Ben’s was kosher. Since it is not, I can not make it in my kitchen. I will be buying it to make at my parent’s house when we have meals there since it was a nice change from our usual brown rice. Disclosure: I wrote this review while participating in a blog campaign by Mom Central on behalf of Uncle Ben’s and received samples to facilitate my candid review. Mom Central will be sending me a gift card to thank me for taking the time to participate. Thanks for the review. I’ve seen others talking about this product and was interested in trying it. .-= Jolly Green Mommy´s last blog ..Happy Memorial Day! =-. How do they get it to be twice the fiber of brown rice? I would have to compare the processing of the rice vs. simply eating brown rice. .-= Devo K´s last blog ..The true intentions behind the "humanitarian" flotilla to Gaza (May 2010) =-. .-= RobMonroe´s last blog ..Wordless Wednesday – At the Park with Daddy =-.